Enjoy an evening of Yogaflow® and meditation with this perfectly-paced extended practice. Connect with your body, your baby and other moms on this transformative journey of mothering. Combining gentle movements for baby with basic flows for mom, this class meets you where you are, engaging body, mind and spirit. No prior yoga experience necessary. Moms with babies who are not yet crawling are welcome. Led by Yoga instructor Jill Buchanan, a Women's Health Nurse Practitioner and Certified Hypnobirthing Childbirth Educator. $50 for the series. Limited to 6 moms. For TriYoga Interns and Teachers and those who want to dive in deeper. Join us after for Community Day, potluck and chanting. Join us for the full Basics Immersion and Training weekend (or just the part that works for you), with opportunities to deepen your Basics knowledge Friday through Sunday. Check our Events page for registration details on each workshop. Join the teachers-in-training for a FREE Basics class as they hone their teaching skills in preparation for certification. This class will include time for feedback and discussion. This short course develops Level 1 knowledge of the subtle practices of TriYoga: breathing, concentration, and meditation. Known as Prana Vidya, these practices deepen one's knowledge of the subtle energy and expand the inner journey. This course is appropriate for those who have taken Intro to Meditation, as well as Basics TriYoga students who have learned breathing practices at weekly classes. Theresa Shay returns to Oakmont, Pa. (20 minutes from Pittsburgh) to share the wisdom and precision of TriYoga flows. Experience the systematized approach of TriYoga that makes yoga accessible to all bodies. Join for the full program or the part that works for you. Scroll down for individual regisration options. TriYoga is going to sleepaway camp at the Himalayan Institute. 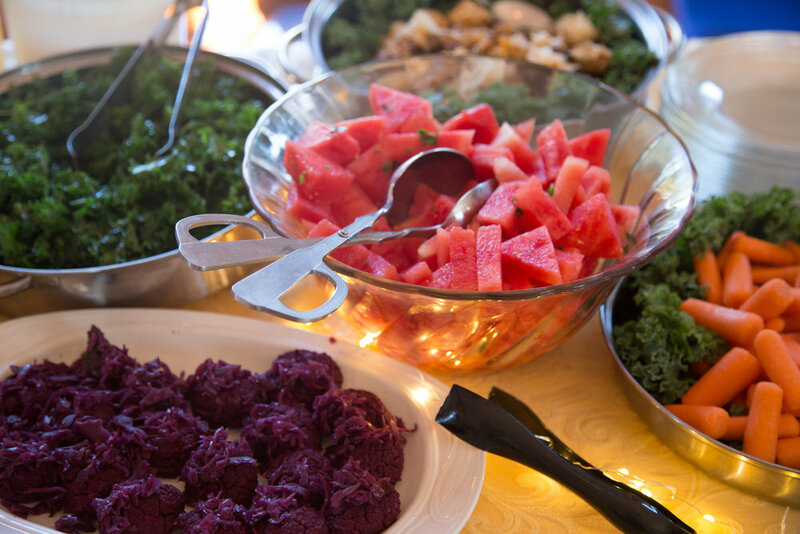 Join senior-level TriYoga teacher Theresa Shay, director of TriYoga of Central Pennsylvania, for a weekend of unplugged fun, yoga, friends, nature and delicious plant-based food. The Himalayan Institute hosts us with peaceful retreat space, simple and clean accommodations, vegan meals, 400 wooded acres of hiking trails and nature, and add-on services such as massage and Ayurvedic treatments through the PureRejuv Wellness Center. The Himalayan Institute is approximately 3 hours northeast of State College, PA.
Once you have registered, we will send you a housing code to use when you reserve your room with the Himalayan Institute. * Those registered by the end of day March 1 will receive the free Prana Vidya Daily 10 booklet. Life demands a lot from us. Join the AAUW and TriYoga of Central PA for a free yoga program that will explore the challenge of holding steady and doing our best amidst it all. "Celebrating Work/Life Balance" will include a presentation, discussion and experiential yoga session accessible for all types of bodies. 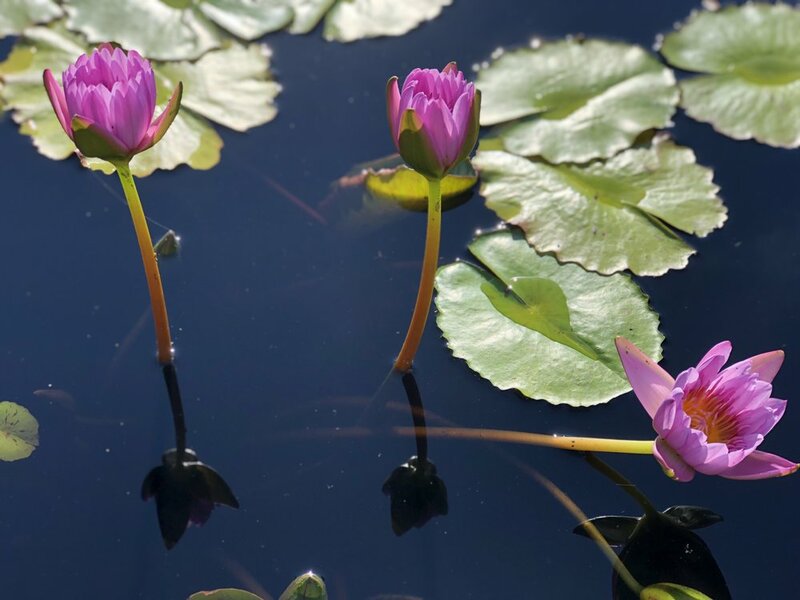 Jill Buchanan, TriYoga Teacher and certified nurse practitioner, will invite you to explore the physical, mental and spiritual benefits of a life in balance through the yoga practices of breath awareness, relaxation in action and meditation. Experience an expanse of calm and quiet, leave with tools to use at home and return to your life with your shoulders a little more dropped, your breath a little longer and your heart a little lighter. Space is limited; reservations required by March 24. E-mail hyde64@gmail.com for your spot today! Celebrate the Basics interns, who have completed their 8-month training, with dinner followed by an evening of community (satsanga) and chanting. 5:30 pm catered dinner, followed by Kirtan. Teacher training illuminates the Flow on a whole new level and is open to all who want to deepen their own knowledge and/or want to share the flow with others. The length of time needed to certify depends on one's experience, ability and time dedicated to the process. Participation in this program is one aspect of becoming a qualified Basics TriYoga teacher and does not necessarily result in certification. Patanjali, author of the Yoga Sutras, offers a structural framework on how to lead a meaningful life. Called the Eight Limbed Path, it includes precepts for personal and communal living, yoga poses, breath work and steps toward meditation. The Path is an organic process that resonates in each person's life differently. In this workshop, participants will learn about the eight limbs and create an artistic expression of the concepts as the philosophy is presented. (All range of artistic abilities is welcome!) Participants are encouraged to bring art materials to use in addition to the basic materials provided. This workshop has been rescheduled. Please contact info (at) pennsylvaniayoga.com if you’d like to be notified about a future date. Memberships will be on hold. Members and non-members may drop in for $10. Memberships will be on hold. Pre-registration required. Members and non-members may drop in for $10. Meghan McGinty’s life on the mat has spilled over into her personal and professional life. For her fellow teachers, she leads weekly after-school guided meditations, “an eye in the hurricane” that helps them get through to Friday. She credits TriYoga for strengthening her relationship with her colleagues, students and partner. Release holiday tension with Meghan and prepare for a peaceful winter season through Prana Vidya breathing & meditation. Any and all levels of meditation experience welcome! Bellefonte on High St. Grand Opening: Meditation Class—Beginners Welcome! Join Linda Ruth for the first meditation class at the new TriYoga Bellefonte! All are welcome at this free class, whether you're new to meditation or TriYoga or have been practicing for years. This class is free, but registration is required. Make a day of it and attend our Grand Opening All-Levels Class (11:30 am -1 pm) and Open House (2-4 pm), featuring giveaways from Bellefonte businesses and friends, as well as information on all of our classes, private sessions and group events. Bellefonte on High St. Grand Opening: TriYoga for All Levels—Beginners Welcome! Join us for a Bellefonte First Sunday yoga class at the new TriYoga Bellefonte! All are welcome, whether you're new to yoga or TriYoga or have been practicing for years. We have props, including mats, at the studio. The class is free, but registration is required. PLEASE NOTE: IF THIS CLASS IS FULL WHEN YOU GO TO REGISTER AND YOU WOULD LIKE TO JOIN THE WAIT LIST PLEASE E-MAIL INFO (AT) PENNSYLVANIAYOGA.COM. Make a day of it and attend our Open House (2-4 pm)—featuring giveaways from Bellefonte businesses and friends, as well as information on all of our classes, private sessions and group events—and our Grand Opening Meditation Class. You are invited to TriYoga Boalsburg for a Global Textilian Holiday Pop-Up. Proprietor Lynne Hopkins sells hand-crafted textiles from around the world and had a booth at Memorial Day. Lynne is bringing beautiful, unusual items that are reasonably priced and smartly sourced. Start your shopping list now and follow Lynne on Facebook. Prices range from $14 to $75. Credit cards and cash are welcome (no checks please). Come out to Spring Mills for an evening of Kirtan (call and response chanting). Stretch your vocal chords, meditate to the vibration, dance and visit with friends. Like other practices that benefit our health and well being, meditation can be challenging. Experience the systematized TriYoga approach to focusing the mind, known as sustained concentration (Dharana) and meditation (Dyhana). Enjoy this path of breath practices (Pranayama) and gentle body movement (Asana) towards a comfortable seat and settled mind (Mudra) where the inner experience speaks what words cannot describe! Suitable for all. No prior yoga or meditation experience required. Caring for others can be stressful. Join Jill for this mini-retreat for the body, mind and spirit. Experience the relaxing and rejuvenating practice of TriYoga through breath awareness; simple, supported movements for the body and meditation. Benefit from relaxation-in-action, while taking away practices that can be used at home as you balance your own self-care with the responsibility of caring for others—young or old, in any state of health. Please note NEW Bellefonte location. Join Kerri for a rejuvenating practice to observe the change of seasons and support a smooth transition into autumn. Class will include a short strengthening flow to build heat and honor the energy of summer followed by a grounding restorative practice to welcome the energy of autumn including yoga nidra and meditation. Suitable for all levels. Join TriYoga of Central PA and the rest of the local yoga community on Sept. 16 for the 2nd annual Yoga Fest State College — a community-driven, grassroots celebration. 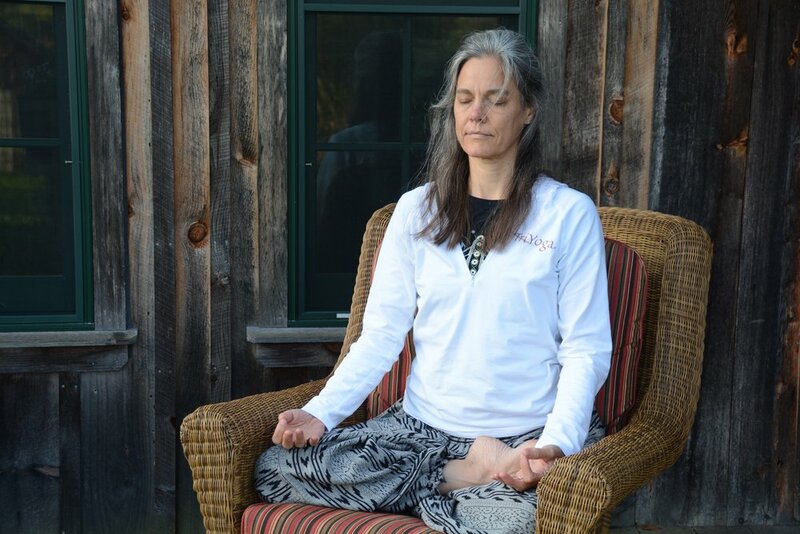 Theresa Shay, founder of TriYoga of Central PA, will explore the guiding principles of wavelike spinal movements, rhythmic pacing, economy of energy and relaxation-in-action. Newcomers to TriYoga will experience the “Art and Science of Yogaflow,” a practice taught in more than 40 countries around the planet. Bring your mat, two blocks, a tie and a pillow/blanket if you have them. Some props will be available to borrow. All are welcome. TriYoga teacher Kerri Zelman, who will teach a new prenatal class at TriYoga Boalsburg this fall, will lead a workshop on Pelvic Floor Heath for Women. Through yoga, movement and meditation, participants will explore the mysterious, yet often overlooked part of the female anatomy that plays a vital role in physical health and overall sense of well-being. Newly certified TriYoga Prana Vidya teacher Linda Mantz will lead a workshop on Yoga and Recovery, an exploration of how the practice of yoga complements the journey of recovery. This workshop will begin and end with centering the breath. Justine Andronici, a certified TriYoga instructor who teaches movement, breathing and meditation at Path to Calm, will explore the power of breathing practice to transform awareness. 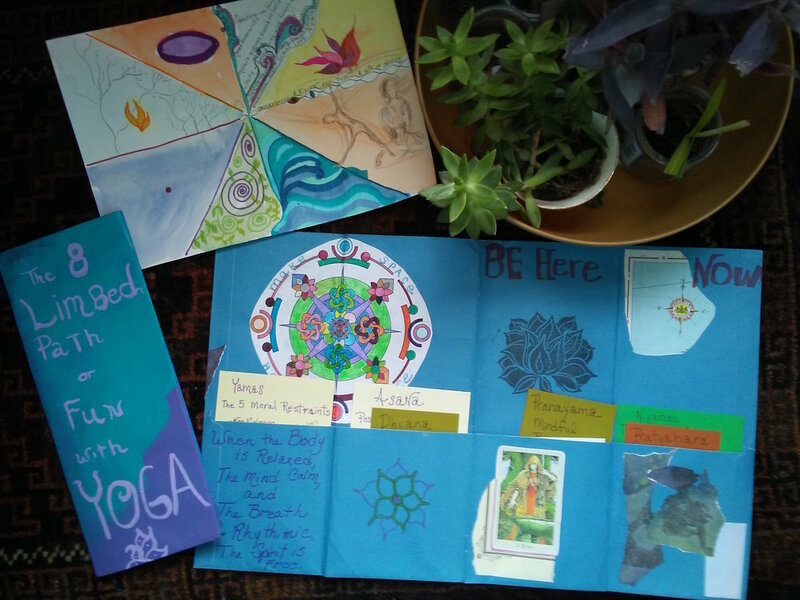 In “Breathing Through Change: Pranayama for Changemakers,” students will leave with tools to cultivate a peaceful mind. The event also features an Open-air Mindful Market with vendors, including TriYoga flow-er Cindy Spiegel (who was also at summer camp) and her tarot readings. Learn more at YogaFestStateCollege.com and contact the organizers if you'd like to volunteer. This event is limited to 200 participants. THIS WORKSHOP IS CANCELED, BUT THERE'S STILL SPACE IN THE BASICS/L1 WORKSHOP AT 11:30 AM. MODIFICATIONS WILL BE OFFERED FOR THOSE WHO DESIRE A MORE ADVANCED FLOW. SIGN UP HERE. 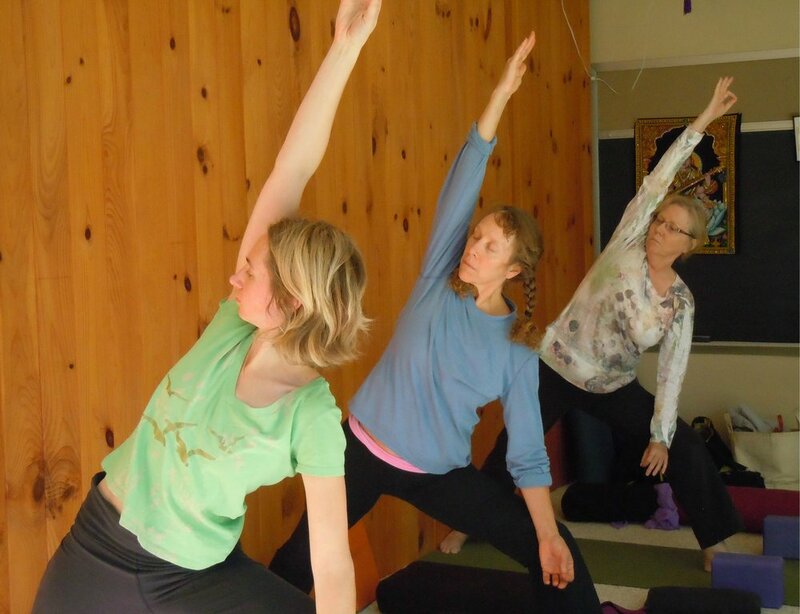 Join Kashi, Teacher in Residence, for Levels 2/3 flows. Kashi is the owner/director of Devi Yoga Center in Sebastopol, CA. A senior teacher of TriYoga International, she has studied with Kaliji, the founder of TriYoga®, since 1991 and is part of the TriYoga Teacher Training staff. Kashi creates a safe and joyful environment for students to enter deeply into the inner flow, while giving clear, precise guidance for the correct alignments and systematic flowing sequences that are unique to TriYoga. A Certified Yoga Therapist, she holds additional yoga certifications from Sivananda Yoga, Yoga of Recovery and Niroga Institute. Join Kashi, Teacher in Residence, for Basics/Level 1 flows. Kashi is the owner/director of Devi Yoga Center in Sebastopol, CA. While many of us know that addiction/alcoholism is a disease, too few recognize it as a “family disease,” which may emotionally, spiritually and often physically affect those surrounding the “addict.” Family members and loved ones begin to develop their own form of the disease (ie: PTSD, stress, anxiety, co-dependency, insomnia, shame and fear to name a few) in an attempt to deal with the chaos of what is happening in their lives. In this workshop we will be looking at how we have been affected by this cunning and baffling disease and how using recovery tools such as the 12 Steps of Recovery along with the teachings of yoga can help in the journey toward healing, balance and a life worth living. This program is open to all who live with or have lived with the problem of alcohol/addiction in a friend, loved one or themselves personally. If you are struggling and suffering, if you feel the pain, stress and loneliness of life, if you notice there are behaviors you resort to that aren’t serving you—and you are ready to say, “there must be a better way”—then this program is for you. Please note: we require alcohol/chemically dependent participants to have at 30 days of continuous sobriety. Those with eating disorders and behavioral addictions (relationships, gambling, spending, etc.) are welcome and should have enough stability to attend this 2.5 hour workshop. A senior teacher of TriYoga International, she has studied with Kaliji, the founder of TriYoga®, since 1991 and is part of the TriYoga Teacher Training staff. Kashi creates a safe and joyful environment for students to enter deeply into the inner flow, while giving clear, precise guidance for the correct alignments and systematic flowing sequences that are unique to TriYoga. She holds certifications from Yoga of Recovery, Sivananda Yoga and Niroga Institute, and is a certified Yoga Therapist. 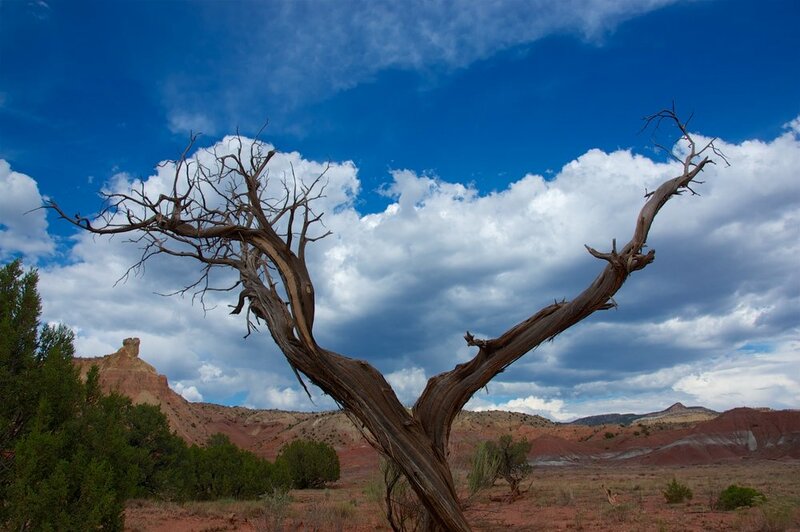 Join Theresa and her husband Glenn Mitchell, director of Oasis Ministries, for a weeklong trip to Ghost Ranch, New Mexico. The week will include a regular rhythm of silence and sharing, plenty of opportunities for hiking and solitude in the high desert landscape, and yoga and meditation led by Theresa. This program is hosted by Oasis Ministries. More info here. Space is limited; early registration is encouraged. Our 4-week chair adventure begins with movements to free the hips and spine. This course is designed for students who are unable to get to the floor, as well as those who spend many hours a week sitting at a desk. Wherever you are, we will get the body moving. Note to existing TriYoga students: After selecting the “register” button below, please complete form (no need to upload profile photo again), then follow prompts to return to your account. Remember when "summer" meant heading off to camp? Well, gather your sleeping bags and pack your mats. TriYoga is going away to sleepover camp! Camp program includes morning meditation practice (Prana Vidya), morning and afternoon yoga classes, evening programs (Satsanga by the campfire), 100% plant-based meals prepared with love and time for solitude or community as desired. All scheduled sessions are optional. Choose between a large bunkhouse (that sleeps about 50) with internal bathroom and smaller bunkhouse with separate bathhouse close-by. There are plenty of lower bunks for everyone who wants one. Of course, we're happy to let you sleep on a top bunk—the perfect spot to write a postcard to home. Join Theresa for a morning of Yogaflow and meditation. Celebrate sunshine, recover from the school year, stretch out your gardening body and leave feeling ready to enjoy the rest of your summer. Join Matt for one of these yoga and acupuncture treatment combos. A 60-minute yoga flow is followed by an extended period of deep relaxation using acupuncture to enhance the benefits of your yoga practice and encourage gentle relaxation and detoxification. Each class is limited to 10 participants. Are you interested in deepening your practice? Are you a certified Basics teacher curious about Level 1 certification, or a certified Level 1 teacher wishing to expand your knowledge? 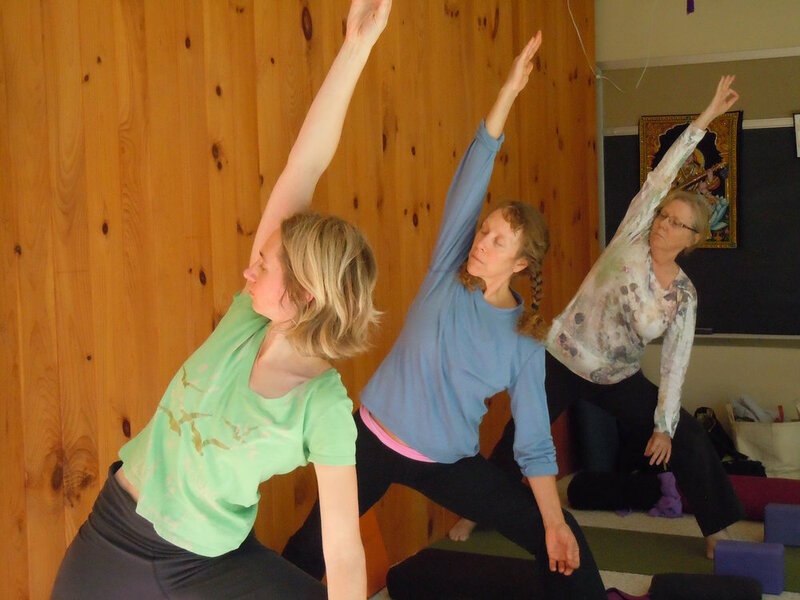 Held over the course of 10 weekend programs, Level 1 Teacher Training refines the flow in your own body, shows you how to assist others, and covers how to speak the flows and lead classes, providing hours in technique, teaching methodology and practicum. Participation in this program is one aspect of becoming a qualified Level 1 TriYoga teacher and does not necessarily result in certification. Participants must be enrolled as Level 1 interns with TriYoga International. Register for the entire program, Fridays only (6-9:15 pm) or Saturdays only (10 am - 4 pm). Sunday programs (10 am - 3 pm) will be held on the first and last weekends. Spend the weekend sinking in. Students who would like to deepen their practice are invited, along with Basics interns and teachers. This program includes an extended Yogaflow® sequence each day, opportunities to give and receive hands-on assists, and practice reading and leading TriYoga® flows. *This program counts as TYTT hours for Basics interns. Come for the full program or whatever your schedule allows. Scroll down for individual registration options. Join Theresa for an afternoon of advanced practices including Prana Vidya (breathing, concentration and meditation). Level 2 modifications will be offered.